I commonly refer to St. Patrick's day as amateur drunk night. Seem everyone likes to get out and drink green beer. Not really sure what the fascination with green beer is, but people sure love it. Maybe they think it is healthier, I don't know. One thing I do know is that if you plan on going out and drinking, make sure you have a designated sober driver. If you don't have one, plan on saving enough money for a taxi or using public transportation to get home safely. Some communities even have a sober ride program for St. Patrick's day. Also important is to take a friend's keys if they have been drinking. It could save a life! 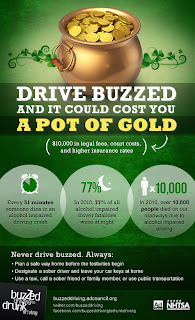 Remember, buzzed driving is drunk driving! Follow Buzzed Driving is Drunk Driving on Facebook and Twitter to learn more about the financial and life threatening implications of buzzed driving.